The pressure on a fluid can be measured depending on two systems where one system measures pressure above the absolute zero pressure scale and the other measures below the absolute zero pressure scale. Hence there are different pressure terminologies in fluid mechanics. Relationship between different pressures is shown in figure-1 below. Absolute pressure is the pressure that is measured with reference to the absolute zero level in the pressure scale. The figure-1 shows absolute pressure with reference to absolute zero level. Absolute pressure can never be negative. It is represented by ‘p’. Note: Atmospheric pressure is the pressure present in the atmosphere. Absolute zero pressure or vacuum level is the space where there is no pressure acting. Gauge pressure is determined by the means of a pressure measuring instrument where the datum would be the atmospheric pressure. On the scale, the atmospheric pressure is marked as zero. 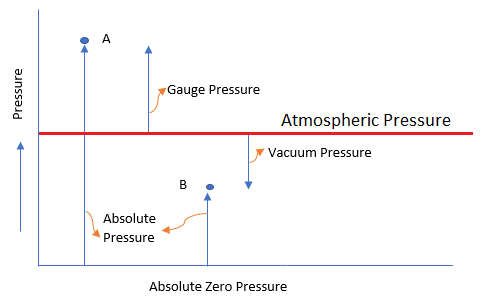 Vacuum pressure is the pressure below the atmospheric pressure. Vacuum pressure is used when the gauge pressure is negative. Positive vacuum pressure means the gauge pressure is negative. Note: The atmospheric pressure at sea level at a temperature of 15 degree Celsius is 101.3 kN/m² or 10.13N/cm² in SI units. The atmospheric pressure head is 760mm of mercury or 10.33 of water. A simple problem is used to explain the determination of pressures. Problem: The density of a given fluid is 1530kg/m³ at an atmospheric pressure equivalent to 750mm of mercury. Determine the gauge pressure and absolute pressure at a depth 3m below the surface of the fluid.